Monday, Monday! To give you something bright and cheery to look at, to start the week out right, here’s some development on a little bit of stitching. I’m working up this sample of an embroidered tree to demonstrate what can be done with the thread I’m using. I really didn’t intend for it to be a major project. It’s not – it’s pretty simple, fairly relaxing stitchery, and not toooooooo time consuming, but more time consuming than I originally intended. I am an absolute inveterate optimist when it comes to judging time and how long it will take to complete even the smallest project. …after all, it’s just a few sketchy little stitches. And 6.5 hours later, I’m still whipping it up, and not near finished. When I posted an update on my Needle ‘n Thread Facebook page this weekend, some folks wanted to know the size of the tree and to see it in context. I haven’t taken a photo of the whole tree in context with anything else yet, but here’s a photo of the whole tree when I left it last. If you want to see it in context with a pair of embroidery scissors, you’ll find a photo on this article featuring some tips on sizing French knots. The tree is just a tad over 3″ high, so it isn’t too big. This little bit is the only progress I made on any stitching over the weekend. I put in four hours on it, and when I finally looked up at the clock and back down at the tree, I was really surprised that it hadn’t finished blooming yet. Where does the time go? And why does it take me so much longer to do things than I think it should? I’ll tell you this: I had so much fun in those four hours! It was relaxing, a little methodical and mesmerizing, and it required zero thought. I was listening to an engrossing audio book, and I had no idea that four hours had passed. That’s what I call a good stitching session! It is coming along beautifully, Mary. I just love listening to audio books and doing embroidery. Now if I could do that while sitting on the porch of a cabin overlooking a quiet mountain lake…. or the beach! Well, THEN!! Yeah, I would have to have a “spotter” so I would stop for eating and bathroom breaks. And sleep. Like everyone else, I just love this little tree! It’s become one of my favorites of your pieces, right along with the hummingbirds and the table runner. Beautiful work! I love this little tree! Can I buy the pattern somewhere? It looks fantastic. I’m sure there’s no answer for this but as I’m looking at each little knot and leaf, I wonder how you know where to put each blossom, each leaf, which color to use, how large you want the knot to be. Whew. I would make the mistake of lining things up neatly, so many dark pink knots on each branch balanced with a certain amount of light pink knots and green leaves. What a mess that would be. 🙂 Your tree is beautifully random and natural looking. Then again, you know what you’re doing. It looks like a fun project and beautiful design and lovely stitching, I love the different sizes of the french knots and the colours really blend well. French knots always take a long time as I’ve experienced especially if you are stitching both little and big french knots. I like listening to audio books as well when I’m stitching or a good film the time really flies. Thanks for sharing your progress on the tree it’s lovely. Mary the tree is beautiful!!! It was worth all the time you spent on it. Would like to know more about the tree itself. How you did the trunk and the thread you used for it. Beautiful. I note that you spent four hours on your knots and leafy tree one day…which makes me think to ask what sort of care you take with your hands to prevent repetitive use problems? Knock wood I haven’t had carpel tunnel issues but I do have arthritis in the fingers that hold the needle. I have overused it in trying to finish projects–which results in having to completely stop for weeks or even months while the swelling and pain recede. I would be really interested to hear how you and your readers ward off injuries since you are stitching so much–exercises or work/break time or any supports like hand-ease gloves iet or other practices that prevent or minimize injuries. Hi, Ruth – that’s a good question, and hopefully, some others will chime in with their insights. I normally take breaks when I’m stitching, just because I have to do other things. I rarely sit still for hours at a time. I also sit on a stool that rocks a bit (it’s called a Buoy, by Steelcase – not necessarily the kind of seat for everyone, I admit, but it works well for me, because I do a lot of up and down stuff). The movement of the stool keeps me from sitting in the same position for any stretch of time. As for the hands part, this is where a floor stand or table stand really comes in handy. Since I’m not gripping a hoop or frame, my hands are rarely held tight in one position for any length of time at all. This is very important for anyone who has arthritis or other hand / joint / circulation issues. I’ve not had any issues like that, but I would imagine, if you do, a stand to hold your hoop or frames would pretty much be essential. I don’t know how much this will help with arthritis, but I sometimes have pain in my hands from long-ago injuries (broken fingers and a scarred tendon from a deep cut), and eucalyptus oil mixed with regular hand cream helps very much. If my hands are being especially uncooperative, I massage the lotion in before bed and wear sleep gloves overnight. Mary, Your little tree is just fabulous. Like everyone else, I’m in love with it. And like others, I also would like to know more about how you did the stitching on the trunk and decided on placement of the leaves and flowers. I would dearly love to be able to create something so beautiful. Thanks for all of the information and inspiration that you give us. Dear Mary This is really exquisite. thank you so much for your inspirational beautiful stitching and your wonderful chatty style, I really look forward to it each day. 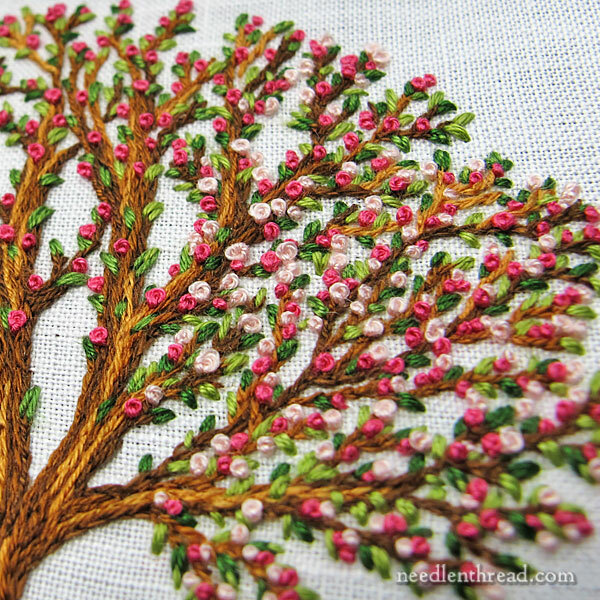 I found a link for the embroidered tree on the French Knot article, but it sent me to an article about beading. Is the tree available on a different link? It’s the “previous page” from the beading article. Nat – that’s what I was looking for. Thank you for your help! LOVE, LOVE this little true!!! Do you have a chart for the tree or did you just free form it for the project?? I’d love to buy a copy of the chart if available!!! Thanks for always keeping us inspired in our stitching, Mary! You were really “in the zone” and that is when any hobby or activity is the most satisfying and, I think, productive! Lucky you! Excellent. Would love to see the back, also. How gorgeous! I have stitching envy – uh oh! I have a love/hate relationship with french knots and a project to practice them is a good idea for me, perhaps I will tackle a similar tree. Thank you so much for sharing and as ever for your helpful tips. The tree is wonderful, tho the thought of that many knots makes my eyes cross a bit. Not that I dislike making them, but because it sure doesn’t seem like you get very far for so much work. Will you be writing this project up at all? It looks like a fun embroidery that could easily be expanded into a “four seasons” series. Wow. Both trees are beautiful and I love the manner in which you show how different types of stitching can make the same tree look different. Absolutely gorgeous. Mary-Your letters make my mornings so bright. Out of curious itch, have you considered doing this lovely little tree in an autumn scheme also? Would make a darling companion piece. Hi, Debbie – yes, I’m thinking about it! I do have an autumn tree on the site already, made a little differently, mostly with couching techniques. Trees are fun to stitch! Dearest Mary, I’m good at copying and following directions but I’m not so good at creating my own design, stitches, colors, etc. I really love the little tree! and am thrilled that you may be coming up with one for the other seasons. Would you, could you either do a down load beginning with the drawing and go through the whole process or a kit? I think the four of them would make a great gift. Thank you for your time and continual inspration. This is just awesome! I am learning lots from your web site, thank you. 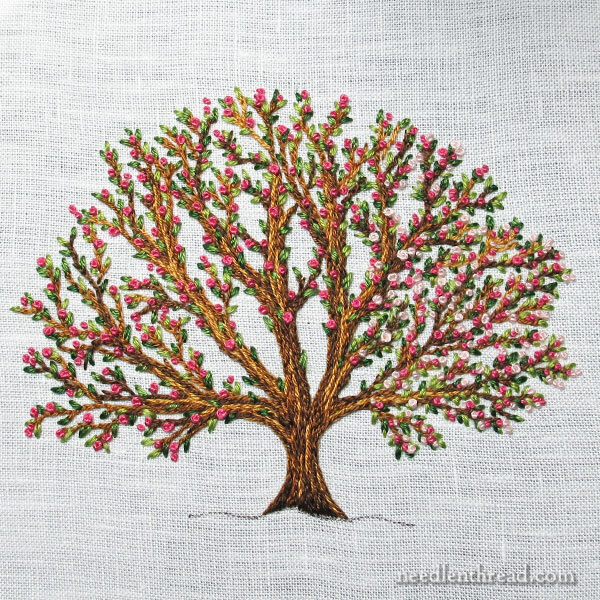 I am a beginner stitcher and wondered the steps it creating this lovely tree. I am working on a crazy quilt, with different things in each block. I think this would be great in my quilt. Hi, do you know where can I get the pattern and stitches for this design? Thank you! Previous Previous post: Goldwork Jewelry Kits – Winners Announced!